Daan and Milena are two young Dutchmen who have been running a small business in street-theatre acts since 2006. In 2011, during a performance, Daan felt the need to take a break and be in a warm bath; Just to escape for a half hour, relax, refresh, and get back in again to go on. 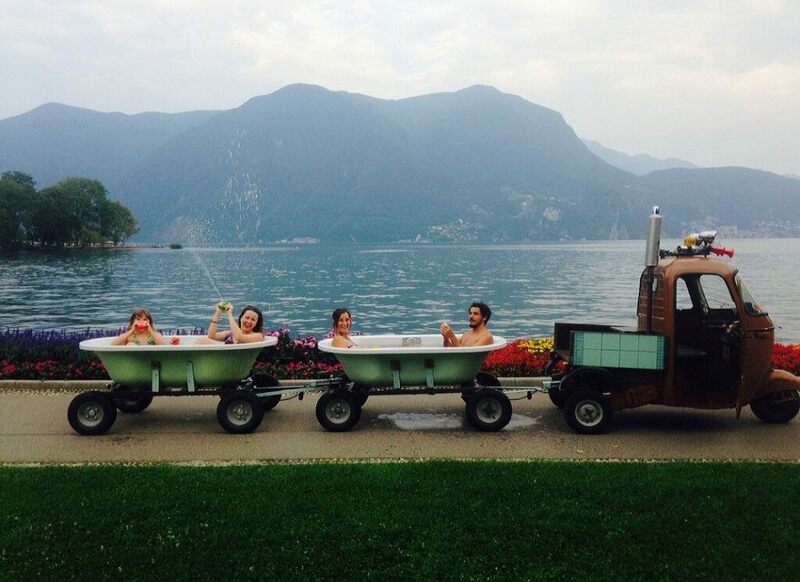 So the idea: to offer people the opportunity to relax with a nice warm bath while they enjoy the landscape, in a bathtub “pulled” by a 1966 Ape. Thus, Vespaqua was born. This original idea was born thanks to a passion that Daan has been cultivating for many years: buying and restoring an historical Ape. 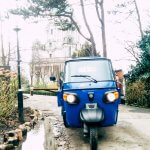 Daan’s Ape, named Vespaqua, has become a theatrical wellness experience for both the young and the old. Vespaqua, the smallest bathing station in the world, was created by Swoolish Garage, and consists of two minty green bathtubs, where the water temperature remains constant. The service also guarantees the supply of swimsuits and towels.